This post started to be about the time – 8:15 and I’m ready for bed, but that would just be silly. 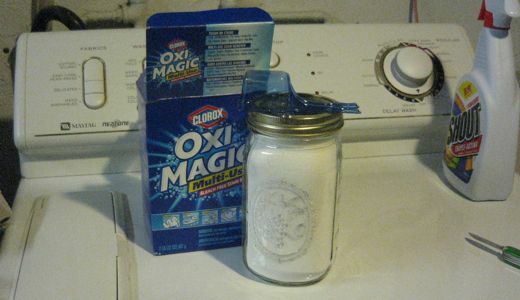 So I went downstairs to throw a load in and thought I’d tell you about my fake Oxy-Clean. Even though Billy Mayes hawks Oxy-Clean, and I believe everything he says, I can’t bring myself to buy the stuff in the big plastic tub. Clorox makes the same thing in a cool box, so that’s what I use. (A box can last over a year.) Yesterday I went to Wal-Mart to get some more….. and they were out! I hemmed and hawed about just buying the regular stuff or the store brand, and decided that I’d just do without. I walked dejectedly down the aisle, past the clearance section – where there was one last box of my stuff! Super-score! I’m good until 2009! Ok, I’ve told my story, it’s 8:17, and now I can go to bed. G’night. Oh, wait. I have to tell you about the teenage boys in the toothbrush aisle. I need a new toothbrush, and as I entered the aisle two late high school/early college boys left. I noticed that they had been wearing cologne, and it was quite pleasant. I thought about it while I searched and searched for my toothbrush, and after several minutes I realized that I was still smelling it. How much were those guys wearing anyway? Your post conspicuously has two words in it that begin with “haw”. The only other words I could think of like that is hawthorn, which is a kind of tree and hawk, which is a kind of bird. Is there a secret message coded into this post? Great, now we have to kill someone else. Dang. And the murder weapon is in the photo.